Mrs. Juanita Barker Tackett, age 97, of Louisville, Kentucky, formerly of Olive Hill, Kentucky, passed away Monday evening, April 8, 2019, at the St. Marys and Elizabeth Hospital in Louisville, Kentucky. She was born November 2, 1921, in Carter County, Kentucky, a daughter of the late Lum C. And Marie Dowdy Barker. In addition to her parents, she was preceded in death by her husband, James E. “Fizz” Tackett; one son, James Donald Tackett; one brother, Donald Barker; and two sisters, Pauline Sammons and Barbara Johnson. 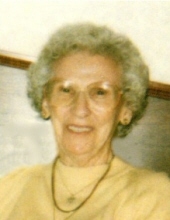 Juanita is survived by one daughter, Vicki Allen of Louisville, Kentucky; two grandchildren; eight great grandchildren; one brother-in-law, Donald Johnson of Lexington, Kentucky; one sister-in-law, Dorothy Barker of Olive Hill, Kentucky; and three nephews, Terry Johnson of Lexington, Kentucky, Mike Sammons of Louisville, Kentucky, and Brent Barker of Boston, Massachusetts. She also leaves many other family members and friends who will sadly miss her. A graveside service will be held at 2 p.m. Thursday, April 11, 2019, at the McFarren Cemetery in Olive Hill, Kentucky, with her nephew, Terry Johnson and Brother Seth Frank officiating. Friends may visit from 1 p.m. to 1:30 p.m. Thursday, April 11, 2019, at Globe Funeral Chapel, 17277 West Highway US 60, Olive Hill, Kentucky 41164. "Email Address" would like to share the life celebration of Juanita Barker Tackett. Click on the "link" to go to share a favorite memory or leave a condolence message for the family.